Be the first to share your favorite memory, photo or story of Nicolette . This memorial page is dedicated for family, friends and future generations to celebrate the life of their loved one. 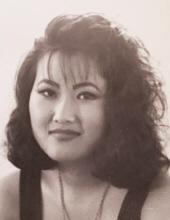 MULLER, Nicolette "Nicky" - Age 48, of Grand Blanc, died Friday, March 29, 2019. Private family service will be held. Those desiring may make contributions to the Nicolette Muller Memorial Fund, c/o her daughters. Nicky was born March 18, 1971 in Seoul, Korea, the daughter of Sun Kwon and Sang Yun Ahn. She was a 1989 graduate of Powers Catholic High School and received a Bachelor's Degree in Nursing from the University of Michigan, Flint. She was employed by Hurley Medical Center, where she dedicated her life to helping others. Surviving are: her daughters, Chloe and Claire Muller; mother, Sun and husband Robert Kittel; sister, Laura Kittel; special friend, Lisa Bohnsack and several aunts, uncles, and cousins. To send flowers or a remembrance gift to the family of Nicolette "Nicky" Muller, please visit our Tribute Store. "Email Address" would like to share the life celebration of Nicolette "Nicky" Muller. Click on the "link" to go to share a favorite memory or leave a condolence message for the family.